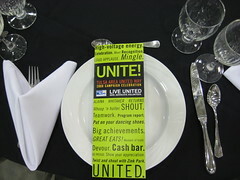 For those of you that don't know, I work at the Tulsa Area United Way. This past Tuesday we had the final campaign celebration and announced the total amount raised. With a goal of $23,934,339, the Tulsa Area exceeded it and raised $24,001,223! The event was held at Expo Square's Central Park Hall. Tulsa's own, Zink Park kicked off the night and came back for the post party. I decided to share some of the photos from the event that show a little bit of what I do around here. I designed the event brand which was carried out on all the materials including the invitation, table cards, programs and event signage. You're so good...I love that your stuff is always unique - not copying what another designer does. That marks talent. Thanks, Ash, you're the best! Mark wanted something totally different so this is what he got!